Cherrylake has been presented two Eagle Awards by the Associated Builders and Contractors for their annual Excellence in Construction Awards in recognition of our work on Disney Springs™ and Altis at Sand Lake. 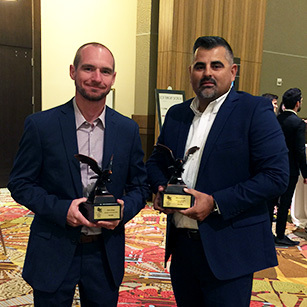 Cherrylake Project Managers James Dyer, Disney Springs [left] and Luis Perez, Atlis at Sand Lake [right] pose with their Eagle Awards at the banquet on October 7th. The Excellence in Construction Awards is a program developed to recognize and honor innovative and high-quality construction projects in Central Florida and throughout the United States. One of the industry’s leading competitions, this program presents Eagle Awards to the top projects in each category, giving recognition to all construction team members from General Contractors to subcontracts to architects and engineers. The projects were each judged on execution of design, quality of craftsmanship, attention to detail, proper installation, outstanding planning and coordination efforts, challenges successfully overcome, project complexity, custom materials, safety program, and owner satisfaction. Disney Springs™ utilized an Integrated Project Delivery (IPD) strategy. IPD attempts to bring contractors together to utilize their full potential at every stage of a project. Over the course of the project, Cherrylake was able to work with Disney, PCL and other subcontractors to form a team that built trust and a strong level of collaboration. Many of the challenges associated with the Disney Springs project stemmed from the task to create a new, thriving entertainment hub within the shell of an existing complex – all while keeping as much of the site open to guests as possible. From upgraded plant material to transplanting six mature hero trees weighing over 60,000 pounds to unique irrigation needs, Cherrylake was able to provide innovative solutions at every stage of this project. At the Altis at Sand Lake apartment complex, Cherrylake was tapped to create an immersive retreat in the heart of the city noise, tourist traffic, and concrete sprawl. As the fourth collaboration between Cherrylake, Barry Rymer at Altman Construction, and Altis communities, the common throughlines of the landscapes were familiar. Many of the designs were similar to previous Altis communities and could be put in place with the efficiency that comes with practice. On this project, however, landscapes were often reworked on the fly to more effectively meet the challenges inherent in the location, including proposing innovative design solutions, creating unique irrigation solutions to fit the site and utilizing our maintenance division to come up with long-term guidelines for the project.